Hello, Hurray! Fans of the original 1970s band Alice Cooper are about to have one of their long-hoped-for dreams come true. The band’s four surviving members, guitarist Michael Bruce, bassist Dennis Dunaway, drummer Neal Smith and vocalist Alice Cooper (lead guitarist Glen Buxton passed away in 1997) spent two days in September at a NYC studio recording three original tracks for Cooper’s next solo album. Rumored to be a follow-up to Cooper’s first solo effort, 1975’s Welcome To My Nightmare, the album is due to be released in the fall of 2011. 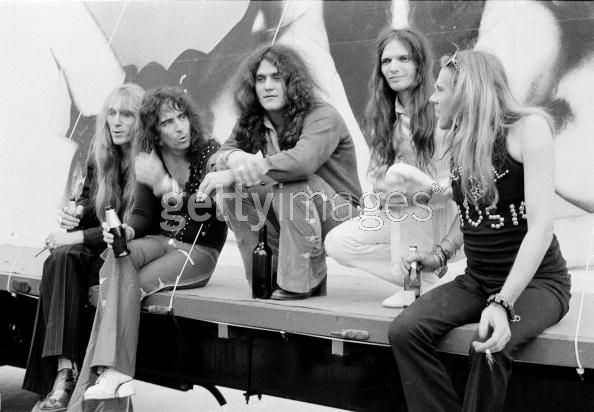 These sessions were the first to feature all members of the original Alice Cooper band since the group recorded its 1974 swan song, Muscle of Love. At the board for these sessions was studio legend Bob Ezrin, who not only produced the band’s commercial breakthrough, 1971’s Love it To Death (featuring the hit single “I’m Eighteen”), but who was also responsible for producing several of their other classic hits, including School’s Out and their most popular and commercially successful album, 1973’s Billion Dollar Babies. Ezrin has also produced many solo albums for Alice Cooper the individual since the band’s breakup. Ezrin, whose exhaustive body of work includes landmark albums such as Pink Floyd’s The Wall, has been quoted as saying that the work he did with the Alice Cooper Band in the seventies gave him his career. It is also rumored that rock photographer Bob Gruen, who took many photos of the original band back in the day – including promotional shots for Muscle of Love featuring the band dressed in identical sailor suits – made an appearance to visually document the band hanging out in the studio. Those Alice Cooper band devotees still hoping for a reunion that would see the band perform live can hold out hope that Smith, Dunaway and Bruce make good on rumors that they will join Cooper this coming December in Phoenix, AZ for his annual Christmas Pudding charity concert event. ← Shop With Gail Feature Added to Worleygig.com! The best and most informative news item I’ve read so far about this. Awesome! You must be beside yourself right now Gail. What I want to know is, what led to Alice finally deciding to work with the guys again?? Well, it’s about darn time. Mmm — Christmas pudding! This is fantastic news, always missed the SMITH/DUNAWAY rhythm section, the clever guitar parts of Mike BRUCE and his songwriting, and of course GB’S spirit will be with them. Saw COOP in LA recently and was quite surprised how strong and gritty his vocals were….like his vocal chords have been rejuvenated!! Great news indeed. How about one night at M.S.G? I am sure it would be great. “Halo of Flies,” “Looney Tune,” “My Stars,” and my personal save…”Hard Hearted Alice.” Hey, I can dream! THIS IS TRULY GREAT NEWS FOR MODERN 21ST CENTURY MEN AND WOMEN ALIKE!! ABOUT FREAKIN’ TIME ALICE. I MUST SAY HIS SOLO CAREER NEVER CAME CLOSE TO THE GREATNESS OF THE ORIGINAL ALICE COOPER BAND. THIS WAS A TOTALLY UNEXPECTED SHOCKER!! WHAT’S NEXT? A WORLD TOUR BY ALICE BOWIE?